Can you call that an act of God? The insurance company won't be paying up, that's for sure. 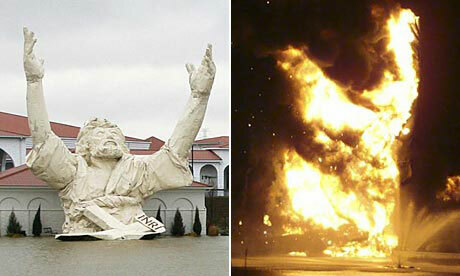 Bishop said the statue would be rebuilt. "It will be back, but this time we are going to try for something fireproof." I've seen this before. It's called "Touchdown Jesus"? Is that supposed to mean something? ^Naw. People call it that 'cause he looks like he's calling a touchdown. But, yeah, it's hilarious. A lot of people didn't like it and are glad to see it go. But that's what you get when you make your statue out of STYROFOAM. Man, how tacky can you get. That statue looked horrendous! When is Fallwell or whoever going to blame this act of God on sports? It's clearly a message that God hates football. I think it's hilarious - God hates bad art. This should be in the cheer me up thread! Yahweh is the ultimate pundit. @tobbA: Nice...I can't not see that image when I scroll up now. They called it....wait for it....and act of GOD! "I believe I can fllyyyy..."